On November 30th we conducted our second Create a Commuter workshop in Spanish at Hacienda CDC. Several committee members from Andando en Bicicletas en Cully (ABC) not only earned bikes, but they also led portions of the workshop – a Create a Commuter first. Yeni discussed the importance of a properly fitted helmet, Lourdes demonstrated locking techniques, and Wendy showed the crew how to remove a wheel, which many of the participants noted was their favorite portion of the workshop. ABC members jumped in on other bike maintenance and riding topics, offering tips and sharing their experiences. 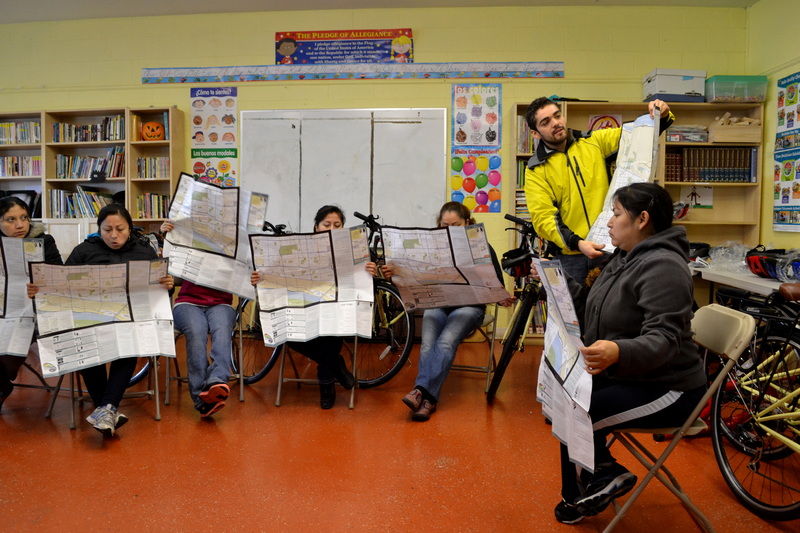 Yeni, Lourdes, Wendy, Rafael, and others have been active in ABC without owning their own bicycles. Initially they joined the committee because they wanted to be involved in their community, they were concerned about safety in their neighborhood, and they wanted their children to learn safe riding habits, while having safe places to ride. This year, members of ABC and residents of Hacienda participated in three of our programs — Create a Commuter, Bike Club, and the Holiday Bike Drive. Because of this, whole families are excited about bicycling and are now riding together. The workshop took place at the Salon Communal on Killingsworth in Cully near several of Hacienda’s housing complexes. 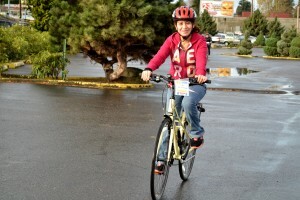 The group rode to Sacajawea Elementary School so that they could become comfortable with the route they plan to use to ride with their children to and from school. 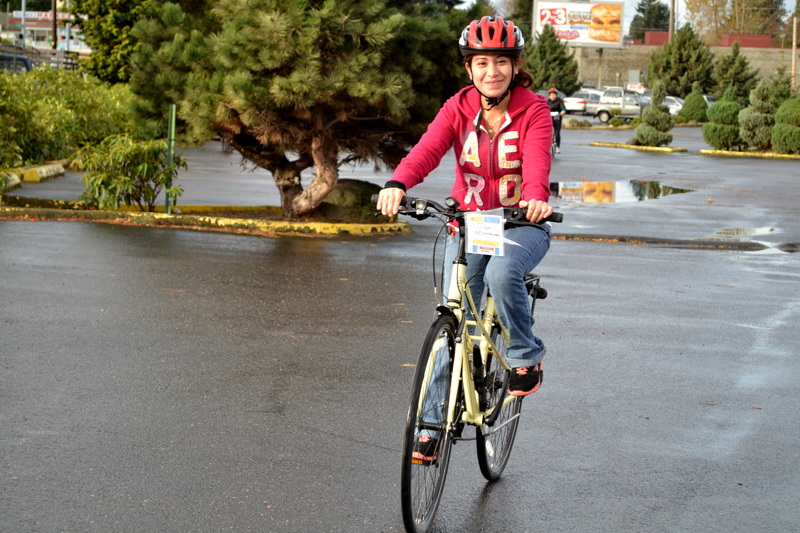 Several women asked Omar, our Community Collaborations Manager and Create a Commuter Instructor, about ways to outfit their new bikes for riding with young kids. After months of learning bike maintenance and advocating for bike storage facilities, the members of ABC were ready to have bikes of their own. We are excited to see so many members from ABC contributing to the success of the workshop. This experience is a wonderful reminder of how bicycles help build community. Our work with Hacienda began with the Understanding Barriers to Bicycling Project and continues today. Like us, Hacienda is included in this year’s Give!Guide – please consider making a gift to support their work promoting healthy living and economic advancement for working Latino families. For more photos from the workshop, visit our Flickr page.